Description of "எம்.ஜி.ஆர். ஒரு ஜீவ நதி (MGR Oru Jeeva Nadhi)"
MGR Oru Jeeva Nadhi is about the dynamics MGR shared with the women in his life, career and movies. This, in turn, reflected in women's endearment to MGR who celebrated him as part of the menfolk in their lives. MGR Oru Jeeva Nadhi how it all worked out to cause such undying admiration of MGR as an icon. The portrayal of women and the sentiments and emotions associated with women did in fact translate into electoral benefits as well making him the darling of the masses and three-time Chief Minister of Tamil Nadu. 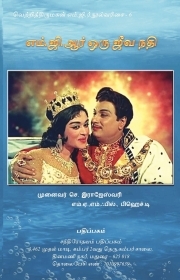 The charisma of MGR has remained a mystery for decades and this book chronicles the same through well-researched events and anecdotes of MGR's life. Dr Rajeswari Chellaiah Ph.D, in translation studies, has published numerous papers on translation. She is best known for her works on MGR, the erstwhile darling of the masses, numero uno star of the Tamil film industry and Chief Minister of the State Tamil Nadu for three consecutive terms. Her true-to-life accounts on MGR were well-researched and revered by those who lived during the times the idol walked on earth and after. Reviews of "எம்.ஜி.ஆர். ஒரு ஜீவ நதி (MGR Oru Jeeva Nadhi)"